Other common names: American skullcap, blue skullcap, mad-dog skullcap, side-flowering skullcap, madweed, hoodwort, blue pimpernel, hooded willow-herb. Habitat and range: This species is native in damp places along banks of streams from Canada southward to Florida, New Mexico, and Washington. 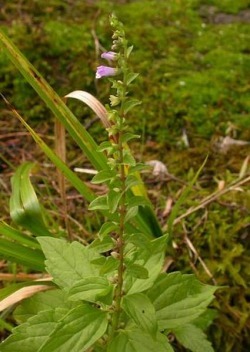 Description: The lip-shaped flowers and squarish stems of the skullcap indicate that it is a member of the mint family (Menthaceae). It is a perennial of slender, erect habit, its square, leafy, branching stem ranging from 8 inches to 2 feet in height, smooth, or sometimes hairy at the top. The leaves are placed opposite to each other on the stem on slender stalks and are about 1 to 3 inches in length and about one-third as wide, thin in texture, oblong or lance shaped, with margins coarsely toothed. They gradually become smaller toward the top, and sometimes those at the very top have the margins unbroken. The flowers are borne in narrow, spikelike, one-sided clusters, generally in the axils of the leaves, but frequently also at the top, and are interspersed with leafy bracts. They appear from about July to September and are blue, shading off to whitish. The tubular, 2-lipped flowers are about a quarter of an inch in length, and the calyx, or outer green covering of the flower, is also two lipped, the upper lip shaped like a helmet and closing in fruit. Collection, prices, and uses: The dried plant is at present official in the United States Pharmacopoeia. The entire plant is collected when in flower and should be carefully dried in the shade. The price ranges from about 3 to 4 cents a pound. Very frequently collectors will gather some other species in place of the official plant, most of those thus wrongly finding their way into the market being generally of stouter growth, with broader leaves and much larger flowers. This plant was once considered valuable for the prevention of hydrophobia, whence the names "mad-dog skullcap " and "madweed," but it is now known to be useless for that purpose. It is used principally as a tonic and to a limited extent for allaying nervous irritation of various kinds.